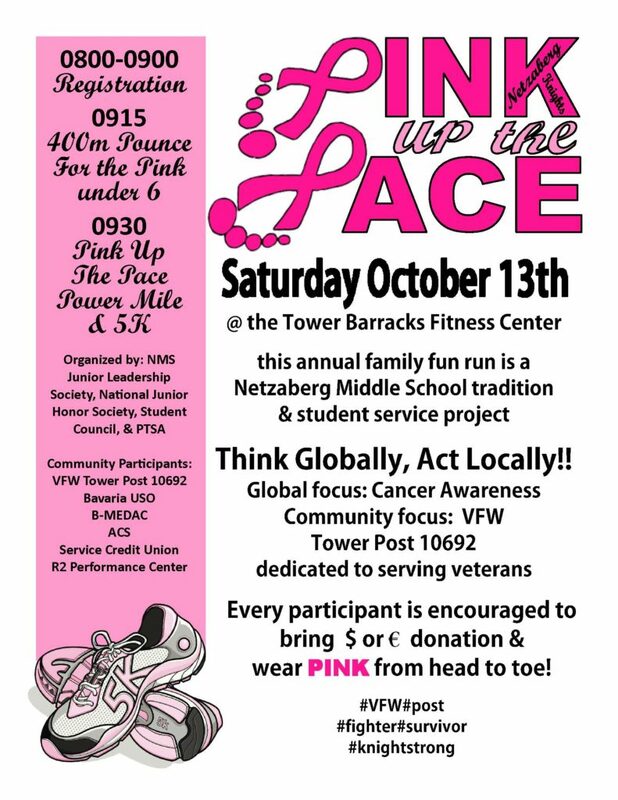 GRAFENWOEHR, Germany — There is a rush of anticipation and positivity for Netzaberg Middle School’s annual fun run, Pink Up The Pace, at the Tower Barracks Fitness Center, Oct. 13. Our student leaders will be hosting the fun run in support of cancer awareness as well as fundraising for Veterans of Foreign Wars Tower Post 10692. The event will take place Oct. 13, with registration from 8 to 9 a.m. This is a fun family event with a 400-meter dash (The Pink Pounce for our pink-under-six years old), a pink power mile for the older kids, and a 5K for the whole family. The first 250 finishers will receive a commemorative race medal. Our friends and family show up in force every year to kick off cancer awareness month and come together as a united community. Various organizations will host a variety of booths with fantastic activities and face painting before the races kick off. We encourage every participant to bring a monetary donation (euro or dollars) and wear pink from head to toe.